I do not subscribe to the notion of guilty pleasures or liking something “ironically”. Either you like something or not. I love the song “You spin me round (like a record)”. I guess it also helps that I do not dislike Luther Vandross’ “I wanted your love” that it apparently was based on. As a matter of fact, I think that Dead or Alive’s 3:19 minutes of fame can be spun on end for extended periods of time without ceasing to entertain me. The fact that There will be a Climax is heavily leaning onto Stock Aitken Waterman’s first numero uno chart hit, both thematically as well as visually, start and ends with it, won me over straight away. 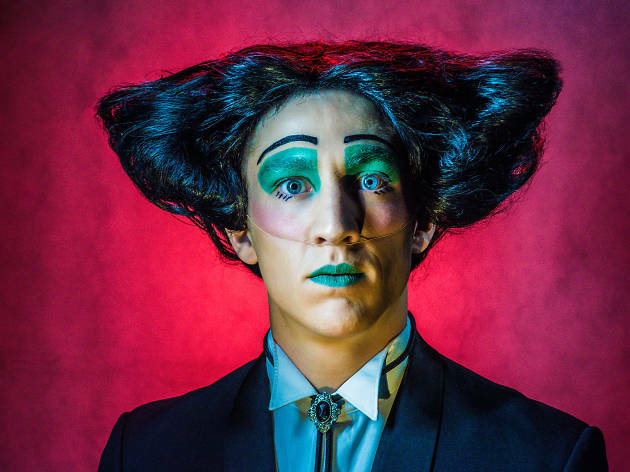 What is sandwiched in between the play, which was originally created by Sydney-based lighting designer Alexander Berlage as part of 2016 graduate productions of Australia’s National Institute of Dramatic Art, is a spinning, colourful, funky and engaging exercise in Dadaism that would have made Samuel Beckett proud. Everything else would enter us in spoiler territory and I’d recommend that you go and check it out for yourself . . .